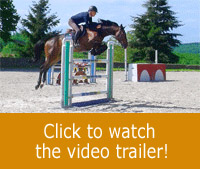 After a preliminary flat work training (click here for video), Michel works on building Day Dreamer’s confidence and physical ability over jumps. This work follows on from the flat work session which addressed the horse’s back, mouth and understanding. Day Dreamer can be anxious in certain situations and tries to get away from the control of the rider, especially approaching fences. Michel will work around his horse’s reactions, giving him some time to understand and gain confidence. He wants to encourage Day Dreamer to not twist himself over fences in order to protect his back. The solution will be to straighten the horse on his 4 feet in order to get a better propulsion over fences. 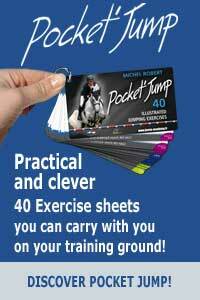 During the debriefing of this session, Michel points out that working a horse over jumps highlights the weakness encountered on the preliminary flat work. However, the session enabled Day Dreamer to improve his control and understanding. Michel advises us to have a lot of patience, analysis and quietude….That’s why you need to believe in yourself and your horse. The future proved him right, as a few days later, Day Dreamer’s improvements paid off with the victory of a 1m40 Grand-Prix at Equita’Lyon. This is an excellent performance for the couple’s first competition.